The story behind ASTRONOMY is one of loss and remembrance, yet many of the tracks on the 11-track, 40-minute CD are quite celebratory. 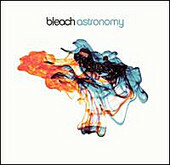 The five members of Bleach lost a close friend (and in two of the member's cases, a blood brother) during combat in Iraq at the time the album was to be released, making this disc's impact quite emotional to say the least. Besides its sentimental value, tracks like the orchestra and piano delivery of "Patience" and the punk rock bounce of "December" have all the components that make an album like ASTRONOMY a special release that transcends your run of the mill, cyclical obligations from generic band A. Instead, it puts Bleach in the category of bands that take tragedy and make beautiful art from the sad experience.